Caloplaca microthallina is a small, attractive, yellow-orange maritime species occurring in both the splash zone and upper littoral zone of siliceous and calcareous coastal cliffs. It consists of tiny scales minutely lobate towards the margins, amongst which are scattered, conspicuous orange discs. It grows best on the black thallus of Verrucaria maura, but is not parasitic on it. It is common in suitable habitats in Ireland, especially in the south and west. 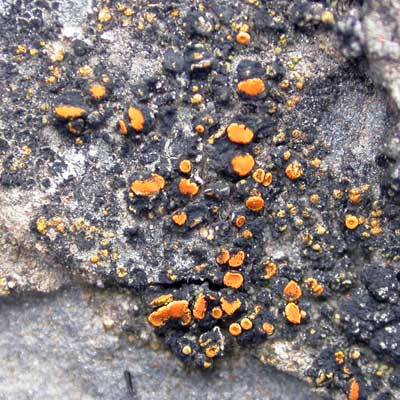 Caloplaca marina is a brighter orange, but the edge of the thallus is never lobate. Simms, M. J., (2016). Caloplaca microthallina (Wedd.) Zahlbr.. [In] LichenIreland.